● Features Connect, a highly reliable, easy-to-use homework and learning management solution that embeds learning science and award-winning adaptive tools to improve student results. 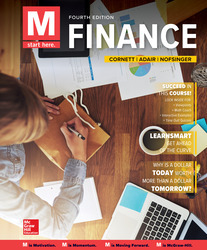 ● Offers unmatched pedagogy and additional resources within Connect to help students solve financial problems, understand the relevance, and apply what they've learned. ● Was written and designed with today's student reader in mind.